Washington DC is officially ready for the holidays! 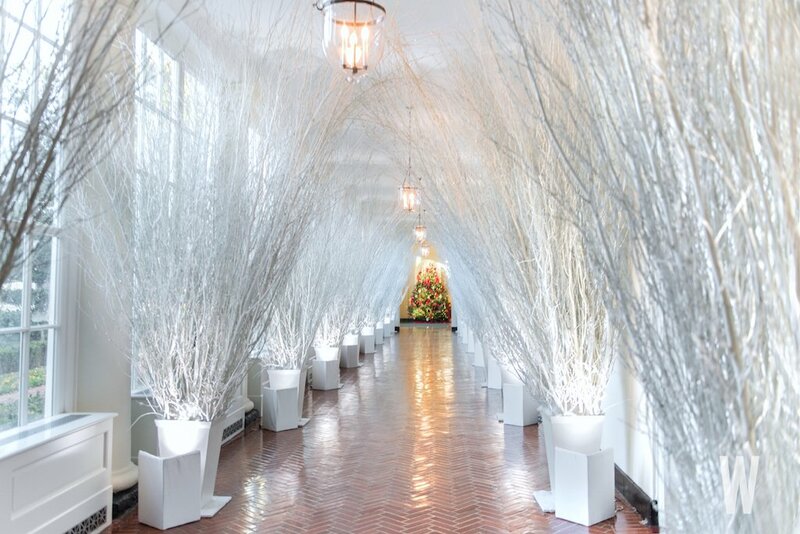 The White House has unveiled its holiday decorations for 2017. Melania Trump personally selected every detail, right down to the edible wreaths hanging from this year’s gingerbread house. 150 volunteers outfitted the executive mansion over Thanksgiving. This year’s theme is “Time-Honored Traditions” and involves more than 1,000 feet of garland, 18,000 feet of lights, 3,100-yards of ribbon, 12,000 ornaments, and 53 Christmas trees. Regardless of political affiliation, we can all appreciate the beauty that Christmas brings. The North Portico adorned with garland and bows. The official White House Christmas tree inside the Blue Room. This 18′ tree comes from Wisconsin and was received by Melania on a horse drawn carriage. A blue and gold color scheme adorns the White House tree. A gilded plateau purchased by President James Monroe for the White House sits at the center of the dining table inside the China Room. President Monroe commissioned the first china service made especially for use in the executive residence. The Cross Hall is outfitted with snow covered trees and looks so elegant! Entrance of the State Dining Room. This year marks the 50th year that the White House crèche has been on display. Snow-topped trees greet guests inside the Grand Foyer, intended to pay homage to the tradition of music at the White House. The Green Room showcases “crafted” decorations created by American artisans, florists, and designers out of natural materials, paper, and fabric. The White House Library holds a collection of more than 2,700 books. A portrait of President Lincoln hangs over the mantel inside the State Dining Room. The annual White House gingerbread house is on display inside the State Dining Room, can you believe this weighs 200 lbs? I wonder if it gets eaten? Have you finished your Christmas decorations, for last minute ideas check out Balsam Hill. Their trees and ornaments are just beautiful! Thanks for visiting, and come back next week for more Christmas inspiration! If you enjoyed this article, please tweet, pin, and repost. Follow along on Instagram HERE, Pintrest HERE, Twitter HERE and subscribe to Happy Haute Home to get bi-weekly inspirational posts delivered to your inbox. I can’t help feeling it’s excessive.